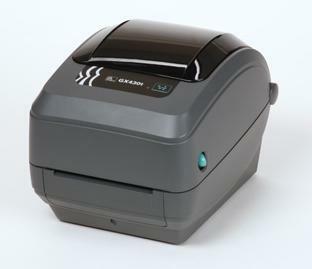 he Zebra GK model is your best value in a basic desktop thermal printer. Its enhanced performance delivers fast print speeds of up to 5 inches per second and fast first label out. USB and serial connectivity interfaces come standard, or use the ZebraNet® 10/100 Print Server option for distributed printing. GX420t TT 4.09" .75" - 4.25" 203 6 IPS 5" .5", 1", 1.5"
GX420d DT/TT 4.09" .75" - 4.25" 203 6 IPS 5" .5", 1", 1.5"
GX430t DT/TT 4.09" .75" - 4.25" 300 4 IPS 5" .5", 1", 1.5"